Anyone making kefir on a regular basis will occasionally end up with separated milk kefir. 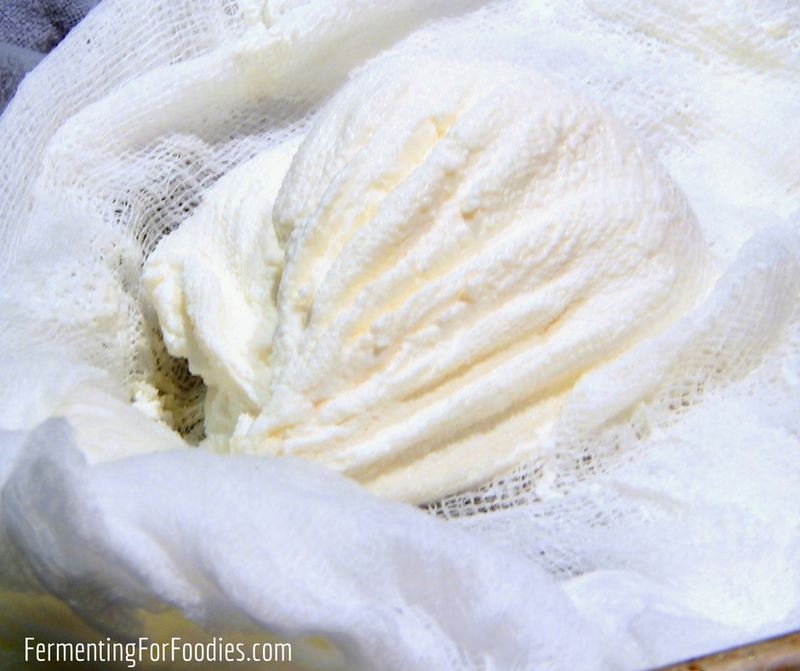 Though it’s the result of over-culturing, it is also a great way to make kefir cheese. In fact, I often purposely clabber my milk kefir because I love kefir cheese and kefir whey. The ratio of kefir grains to milk is off. Check out this post on milk kefir basics for the proper ratio of grains to milk. The milk kefir was cultured too long. It’s best to store your kefir in the fridge if you’re going away on holiday, or take it with you! It was too warm, so your kefir cultured faster than usual. In the winter kefir can sit out on the counter all the time, however, in the summer kefir may start to separate within 12 hours. Kefir makes a sour soft-style cheese. You can use it like ricotta for dishes like lasagna and pizzaiola. It can be flavoured like cream cheese and used as a spread. Like cream cheese, kefir cheese can be used to make frosting and cheesecake. 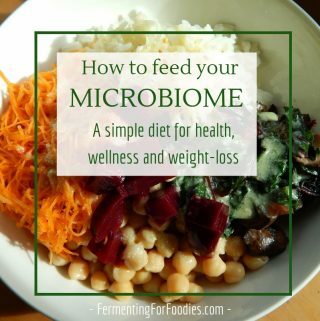 You can also press soft kefir cheese it into a firm feta-like cheese. I love kefir whey. In fact, I often make kefir cheese just because I want to use the whey! 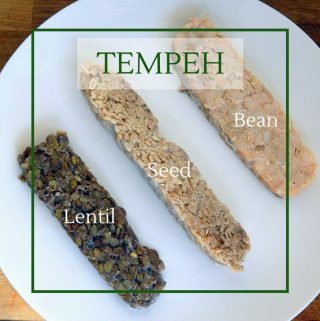 I use it for culturing everything: grains, beans, and vegetables. 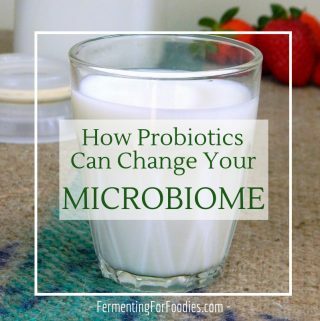 Culture your kefir for 24 hours. Then remove the grains from the cultured milk. At this point your kefir won't have fully separated into curds and whey, so leave it on the counter (without the grains) for another 12-24 hours until it has separated. 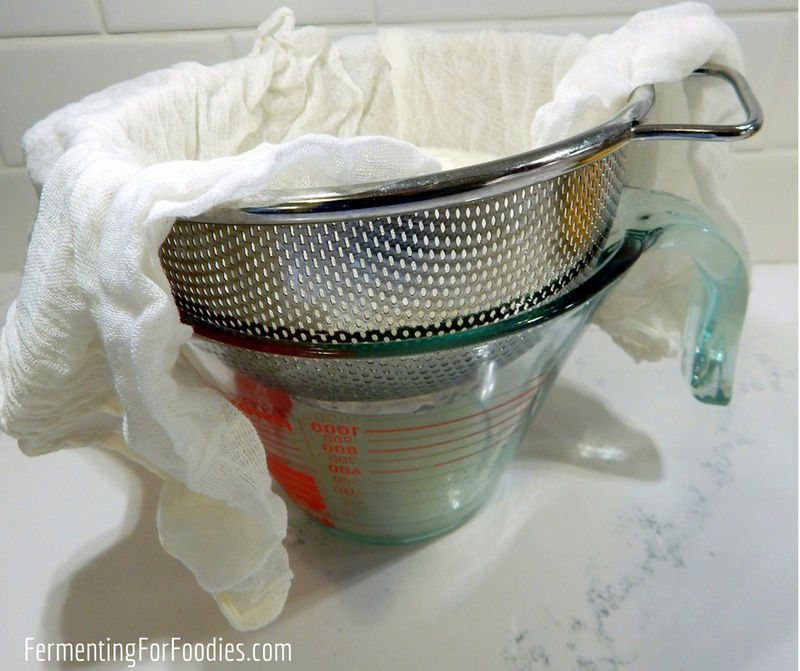 Line a colander with cheesecloth and strain the kefir through the layers of cheese cloth. Allow to drain for 30 minutes. 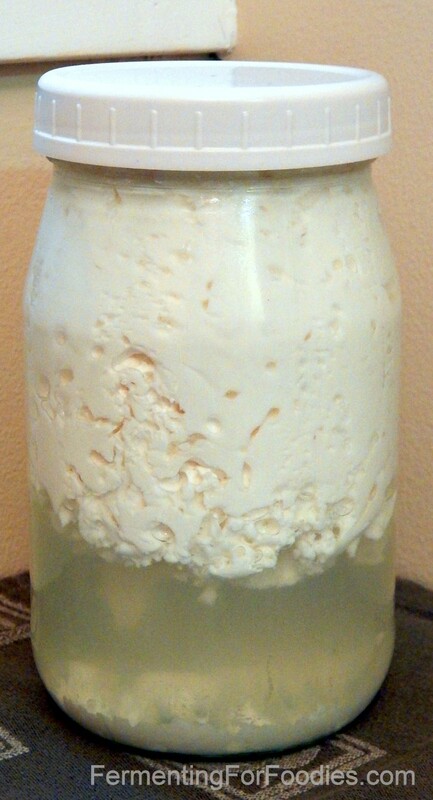 Hang the kefir (as shown in the photo below) and drain for another 4-8 hours. Mix salt into the cheese and refrigerate. 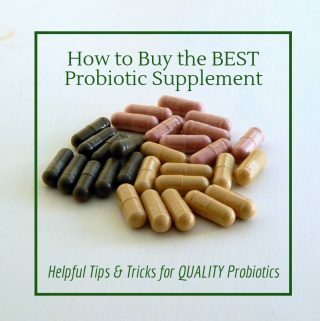 Use within 2 weeks, as it will continue to ferment. -See the photos below for more information on each of the steps. 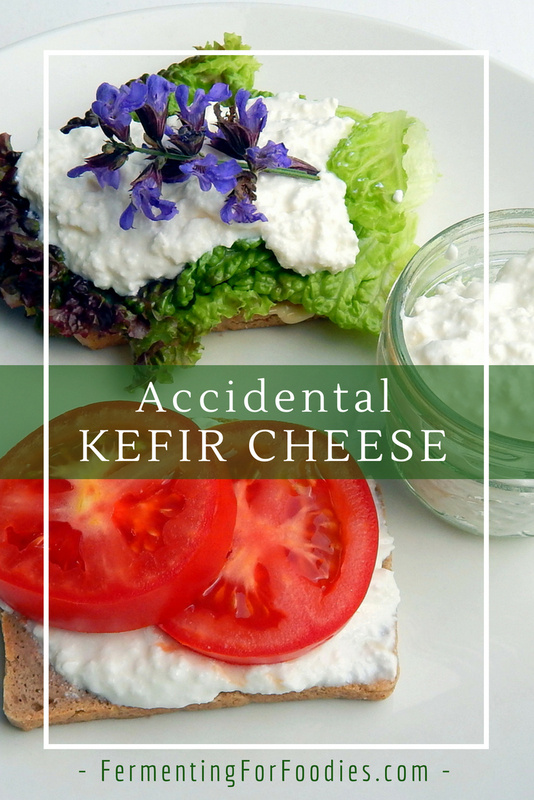 -Kefir cheese is tastier when it’s not made with over-cultured kefir. However, if you accidentally over culture your kefir (before you remove the grains) just use a sieve to strain out the grains, then let your kefir sit for another 2 hours separate again and then make cheese. -If you don’t have milk kefir, yogurt can also be strained into a thick creamy cheese.
. You can also use one layer of actual cheese making cheesecloth. 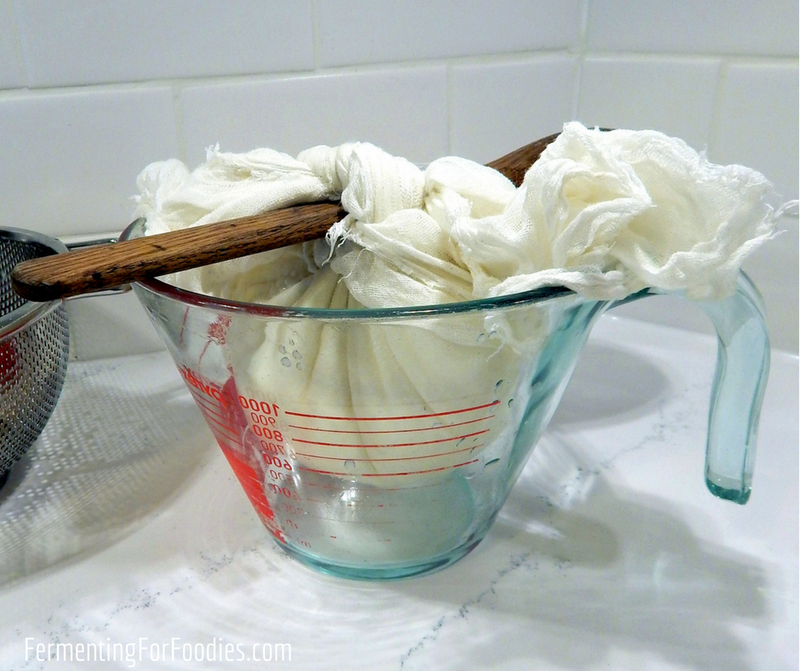 When the whey has strained for about 30 minutes, I gather up the ends of my cheesecloth and knot it together around a wooden spoon and hang it over a large measuring cup. Here’s what the ball of kefir cheese looks like after 6 hours of hanging. It’s firm on the outside, but still quite soft inside. At this point you can finish your kefir cheese by mixing in the salt. This is also when you want to add flavours to your kefir cheese if you want to use it as a spread. I recommend herbs and garlic. This looks interesting for sure! Thank you so much for sharing. I’m gonna try and recreate this kefir cheese at home! You can order kefir grains on Amazon ,it grows fast and soon you will be sharing!